First, let me extend a very warm welcome to the many new Filipino readers that have discovered this blog in the past 24 hours. My husband is from Australia, so I do get down to that part of the world on occasion and I hope to visit your beautiful country at some point in the future. It is great to have you here, although the circumstances of our meeting are, to say the least, unusual. It seems one of your esteemed Senators, Tito Sotto, plagiarized a blog post I wrote on February 23, 2011 entitled How The Pill Can Harm Your Future Child’s Health, lifting entire sections of the article basically word for word that were delivered in a speech to the Senate Floor regarding the possible passage of the highly controversial Reproductive Health Bill. Nice touch Senator. You almost had me convinced you were a nice guy with the tears and all. Many of your citizenry have emailed me assuring me that was a put on, and I’m starting to think they are right. 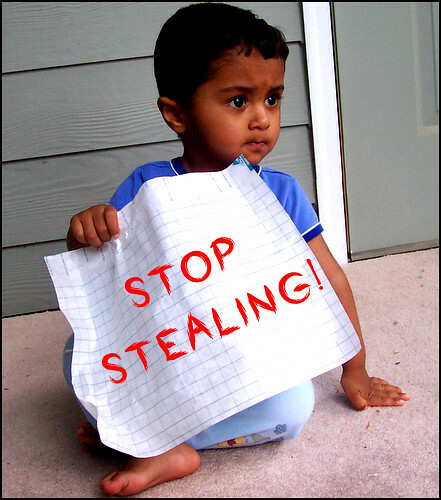 A thief is a thief, Mr. Senator. Denying it doesn’t get you off the hook; it just makes you a lying thief. On the bright side, I am thrilled that your lapse of moral judgment has brought much needed attention to the fact that the birth control pill can have devastating consequences to a woman’s long term health and possibly those of her children and even grandchildren. Gut dysbiosis is a serious condition that has multi-generational consequences that women need to be educated about and completely aware of before making the very personal decision to use them. It was indeed brave of you to take this controversial position. Kudos to you for that. By the way, I am truly sorry for the loss of your son. As the mother of two sons myself, I can only imagine the pain and devastation you have felt from such an experience. While this has been a highly charged and hopefully enlightening experience for all involved, it’s time now to set the drama aside and get back to fighting the good fight by continuing to educate people about how their food and pharma choices affect not only themselves, but also those they dearly love. And although my attorney will likely try to persuade me otherwise, for now I’m moving on as I’ve got work to do. Women of the Philippines: I am terribly sorry my blog was used and twisted against you. You deserve the choice to use The Pill if you want or need to based on your particular circumstances. While I want you to know that this choice has health consequences as does the decision to use any pharmaceutical drug, I in no way would ever condone taking this choice away from you! Mabuhay!